The biggest question of all… What is ADS-B? The actual definition is, Automatic Dependent Surveillance-Broadcast, a new technology that allows air traffic controllers to see traffic with more precision than ever before. ADS–B is an element of the US Next Generation Air Transportation System (NextGen) and the Single European Sky ATM Research (SESAR). ADS–B equipment is currently mandatory in portions of Australian airspace, the United States requires some aircraft to be equipped by 2020 and the equipment will be mandatory for some aircraft in Europe from 2017. Canada is already using ADS-B for Air Traffic Control. Instead of relying on decades-old radar technology, ADS-B uses extremely accurate GPS signals. As an added plus, ADS-B can work where radar will not. Additionally, it can function at low altitudes and on the ground, it can also be used to monitor traffic on airport taxiways and runways. The system will not only allow air traffic controllers to make use of better position information, aircraft will now be able to communicate this data directly with each other in most cases. Why are we switching to ADS-B? So, why are we switching over to ADS-B with the NextGen system? ADS-B allows air traffic controllers to route traffic more efficiently, reducing congestion, noise, emission and fuel consumption. It also promises to keep our skies safer by enhancing situational awareness. And even better, properly equipped aircraft will gain an affordable way to get datalink traffic, as well as subscription-free weather over the U.S. The obvious benefit is safety. Both pilots and Air traffic controllers will have a more accurate picture with regard to what is happening around them. This will be able to reduce congestion, noise, emission and fuel consumption through more efficient routing and resource management. Without a doubt, this is a huge leap forward in situational awareness for both the pilot and controller. In the cockpit, the pilot will have much better resources and multiple sources of information to detect threats and avoid. “Glass Cockpit” technology is not only becoming more commonplace but is becoming more affordable. The information that can now be displayed is not limited to traffic, but also up-to-date weather information provided thru the ADS-B link and FIS-B. This is not limited to panel-mounted equipment. The onset of low cost portable tablets and portable aviation receivers now allow high resolution navigation, terrain, traffic, and weather data to be overlaid on a single device. All of this is available as free information as long as you have the equipment to receive the data. HOW does ADS-B really work? Aircraft will broadcast their identity, position, track, speed and other vital data via what’s called ADS-B “Out” technology. Air traffic control ground stations and ADS-B “In” equipped aircraft receive this information. What is most impressive, however, ATC and other aircraft will see this data reported EVERY SECOND. This information is disseminated every second by the aircraft’s ADS-B out solution and re-broadcasted every second via ground stations or aircraft-to-aircraft. ADS-B ground stations also broadcast subscription-free weather (FIS-B) back up to properly equipped aircraft in the service area for display in the cockpit or portable devices. The update intervals are very important, if not impressive, because ground-based radar has some limitations when compared to ADS-B. The ground radar antenna beam becomes wider as an aircraft gets farther away, making the position information less accurate. Additionally, detecting changes in aircraft velocity requires several radar sweeps that are spaced several seconds apart. Meaning, traffic information can be 6-12 seconds old in some cases. Imagine that gap when two aircraft have a closure rate of 400 mph or more. In contrast, a system using ADS-B creates and listens for periodic position and intent reports from aircraft. These reports are generated based on the aircraft’s navigation system, and distributed via one or more of the ADS-B data links. The accuracy of the data is no longer susceptible to the position of the aircraft or the length of time between radar sweeps. Today’s air traffic control (ATC) systems do not rely on coverage by a single radar. Instead a multi-radar picture is presented via the ATC system’s display to the controller. This improves the quality of the reported position of the airplane, provides a measure of redundancy, and makes it possible to verify the output of the different radars against others. This verification can also use sensor data from other technologies, such as ADS-B and multilateration. WHO needs to upgrade and WHEN? In the U.S., if you operate in airspace that currently requires a Mode C or Mode S transponder, you’ll need to be equipped with ADS-B “Out” by 2020. In the U.S., if you operate in airspace that currently requires a Mode C or Mode S transponder, you’ll need to be equipped with ADS-B “Out” by 2020. This includes Class A, B, or C airspaces, Class E airspace at and above 10,000 ft MSL over the 48 contiguous United States and the District of Columbia, and Class E airspace over the Gulf of Mexico from the coastline of the U.S. out to 12 nm and above 3,000 ft MSL. Even if you don’t fall into one of these categories, you’ll still need an ADS-B “Out” solution if you find yourself flying from the surface up to 10,000 ft MSL within 30 miles of most primary Class B airports. What EQUIPMENT will I need for my aircraft? First and foremost, you’ll need a WAAS position source, such as a GNS 430W/530W or GTN series avionics. This calculates your required position, track, altitude and speed information from signals it gathers from GPS satellites and WAAS signal corrections. First and foremost, you’ll need a WAAS position source…Next, you’ll need a way to broadcast this information to ADS-B ground stations. Next, you’ll need a way to broadcast this information to ADS-B ground stations. If your aircraft flies at or above 18,000 ft over the U.S., or anywhere internationally, you will be required to use the 1090 MHz frequency using a Mode S Extended Squitter (ES) transponder — such as the GTX 330 ES. Aircraft that only fly below 18,000 ft and only in the U.S. can opt instead for a dedicated 978 MHz Universal Access Transceiver (UAT). The 978 MHz UAT frequency will allow you to keep an existing Mode C or Mode S transponder that you may already have. Installing a 978 MHz UAT with ADS-B “In” technology such as the GDL 88 series allows you to view Traffic Information Service-Broadcast (TIS-B) and Flight Information Service-Broadcast (FIS-B) information on a compatible flight display. Find out what equipment you need to prepare for ADS-B. By answering a few simple questions about your avionics installation, where you fly, and whether you want datalink traffic and subscription-free weather data in the U.S., we can make a recommendation you can take right to an avionics installer. Why should I consider a dual (diversity) antenna installation for my ADS-B solution? Antenna diversity technology configures your aircraft with both top- and bottom-mount antennas to reduce the potential for antenna “shading,” which helps prevent target drop out during turns and maneuvers. An optional top-mounted antenna also comes in handy during ground operations, when a bottom-mount mount antenna might not have clear line-of-sight to receive ADS-B ground station signals or transmissions from other participating aircraft. I already have an active traffic system, how will this work with ADS-B? For those who fly outside of the U.S., an active traffic system will still be the only source of traffic information you can receive. In the U.S., adding ADS-B datalink traffic capability can provide you with the most comprehensive traffic picture possible. Our GDL 88 series integrates with active traffic systems. It takes in traffic data from ADS-B sources and active traffic systems (TCAS/TAS/TCAD) then correlates the data. If a single target is being provided by multiple sources then the source with the best integrity is used to display the target. Having an active traffic system will give you traffic data when operating in uncontrolled airspace. If I am receiving and displaying ADS-B “In” datalink traffic, why do I need an active traffic system? When paired with an ADS-B “In” solution like the GDL 88 series, an active traffic system like the GTS 800 series provides the most complete traffic picture possible. During the transition to ADS-B, those that haven’t yet equipped will not be transmitting their information via ADS-B “Out.” In the U.S, when you’re flying outside the range of a TIS-B ground station uplink, you will not see these targets on your flight display. Thus, you’re not getting the entire picture until everyone becomes equipped in 2020. When paired with an ADS-B “In” solution like the GDL 88 series, an active traffic system like the GTS 800 series provides the most complete traffic picture possible. Where are ADS-B ground stations operational? In the U.S., nearly 400 ADS-B ground stations were completed and operational by mid-2012, with most of the rest — totaling more than 700 planned stations — expected to be up and running by early 2014. The graphic below illustrates where ADS-B is up and running. In the areas highlighted in blue, you can already start taking advantage of ADS-B’s datalink traffic and subscription-free weather services if you’re equipped with an ADS-B “In” solution. How can I tell if my currents equipment meets any of the ADS-B requirements? How can I tell if I have an appropriate high-integrity WAAS/SBAS position source? How can I tell if my GTX 330, GTX 33 or GTX 23 is an Extended Squitter (ES) transponder and/or meets the current requirements for ADS-B “Out”? In 2002 the Federal Aviation Administration (FAA) announced a dual link decision using the 1090 MHz extended squitter (1090 ES) link for air carrier and private or commercial operators of high-performance aircraft, and universal access transceiver link for the typical general aviation user. In November 2012, the European Aviation Safety Agency confirmed that the Europe Union would also use 1090 ES for interoperability. The format of extended squitter messages has been codified by the ICAO. With 1090 ES, the existing Mode S transponder (TSO C-112 or a standalone 1090 MHz transmitter) supports a message type known as the extended squitter message. It is a periodic message that provides position, velocity, time, and, in the future, intent. The basic ES does not offer intent since current flight management systems do not provide such data (called trajectory change points). To enable an aircraft to send an extended squitter message, the transponder is modified (TSO C-166A) and aircraft position and other status information is routed to the transponder. ATC ground stations and aircraft equipped with traffic collision avoidance system (TCAS) already have the necessary 1090 MHz (Mode S) receivers to receive these signals, and would only require enhancements to accept and process the additional extended squitter information. As per the FAA ADS-B link decision, and the technical link standards, 1090 ES does not support FIS-B service. What’s the difference between TIS-A and TIS-B? TIS stands for Traffic Information Service. With TIS-A, ATC radar information is collected on the ground and then uplinked to equipped aircraft nearby (known as “Clients”) via ground radar uplinks. Uplinks can occur only when the radar is pointed at the aircraft, so the amount of information transmitted is necessarily limited. TIS-A is currently available in the U.S. at over 100 Terminal Area Secondary Radar Surveillance Areas and is slowly being phased out in favor of ADS-B. With TIS-B, ATC radar information is collected on the ground and then ADS-B ground stations uplink this information to equipped aircraft with an ADS-B “In” receiver capable of receiving ADS-B data on 1090MHz. When the ADS-B ground infrastructure build out is complete in the US, there will be close to 800 ground stations broadcasting TIS-B data. What happens if I have weather from both ADS-B and a datalink provider like SiriusXM onboard? The interface in our avionics allows you to view weather data from both sources individually via the weather menus. In parts of the menu where only METARs and TAFs are displayed (like the waypoint information pages), the data source that is the most recent is displayed and the source denoted for reference. What does DIVERSITY mean, and do I need it? No, this is not a government mandate on hiring practices. Diversity, in the simplest sense, means two. Two antenna to be precise. A diversity installation is applicable on multiple avionics systems and in this case, it means you have an antenna on top of the aircraft and on the bottom of the aircraft that will both send and receive ADS-B frequencies. The big benefit here is eliminating a “blind spot” induced by the position of a single antenna on the airframe and the position of the ground-based tower (or other aircraft for that matter). If you are in a turn it is possible to blanket out reception from a ground based antenna because your airframe is blocking the signal. This is also the case between aircraft, and does not apply just to ADS-B. The same is true for transponder reception and TCAS system reception. What’s so cool about TargetTrend and SURF? On your ADS-B traffic display, Garmin’s TargetTrend™ relative motion technology offers a faster, more intuitive way of judging target trajectories and closure rates in relation to your aircraft’s position. Likewise, once you’ve landed, Garmin’s exclusive SURF display shows relevant airport surface traffic to help you spot potential runway incursions or keep clear of tie-ups on the taxiways. ADS-B allows air traffic controllers to route traffic more efficiently, reducing congestion, noise, emission and fuel consumption. It also promises to keep our skies safer by enhancing situational awareness. And even better, properly equipped aircraft will gain an affordable way to get datalink traffic, as well as subscription-free weather over the U.S.
What do you get by extending your squit? It’s the law. On January 1, 2020, all of us who fly in regulated airspace where a Mode C transponder is now required will need to have an FAA-approved ADS-B system onboard. What’s more, your transponder can be a key element in meeting the new avionics requirements. On January 1, 2020, all of us who fly in regulated airspace where a Mode C transponder is now required will need to have an FAA-approved ADS-B system onboard. ADS-B (which is short for Automatic Dependent Surveillance-Broadcast) technology will be replacing conventional radar-based surveillance as the primary method for identifying and tracking aircraft in U.S. airspace. Using the ADS-B datalink, each airplane will automatically transmit its precise position, its velocity (both vertically and horizontally), as well as its altitude and other information to controllers and other nearby aircraft. Each plane will need a WAAS-capable GPS receiver to provide the high-integrity location and flight path data for ADS-B networking. Under the FAA’s new rules, only ADS-B “Out” transmission capability is required. There is no mandate for ADS-B “In.” However, this optional “In” capability — which receives the tracking data for display in the cockpit — should be a popular upgrade, since it can clearly enhance situational awareness by giving pilots a view of the same basic traffic data that ground controllers are monitoring on their scopes. Additional FAA inducements for adding ADS-B “In” include free datalink weather and various other flight information services. The FAA has already begun to implement the nationwide infrastructure of ground stations needed to support ADS-B. 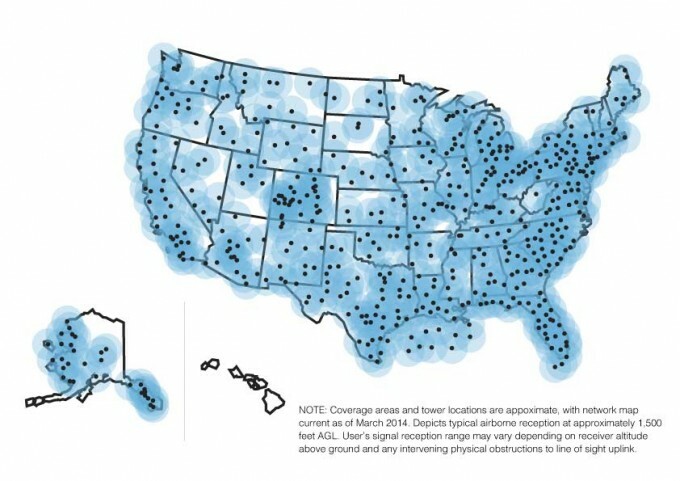 By 2013, the FAA expects to have some 790 ground stations, linked through 4 data-control centers, providing full ADS-B coverage for more than 95 percent of the airspace over the contiguous United States. Now that the rules requiring ADS-B are in effect, pilots and aircraft owners are asking themselves two questions: 1) “What equipment will I need in my aircraft?” And 2) “How much will it cost?” The answer to the first question is easier, because the FAA has designated two options for airborne equipment that will satisfy the ADS-B “Out” requirement: One is the dedicated 978 MHz universal access transceiver (or UAT), and the other is the pairing of a 1090 MHz Mode S “extended squitter” transponder with an approved GPS navigation source (such as WAAS GPS) to provide the required position, vector, altitude and velocity data. As far as the cost-to-install is concerned, neither ADS-B option offers a clear-cut advantage at this point — since the rules issued thus far only specify the performance, not the exact types of equipment needed to certify an ADS-B “Out” installation. When those specs become clearer, so will the projected cost figures involved. Even though it’s called a “Universal Access” transceiver, the 978 MHz UAT is actually less universal that the 1090 MHz “ES” transponder in terms of where it can fly and what airspace it can use. For example, in its criteria for ADS-B “Out” compliance, the FAA will require 1090 ES transponders for aircraft operating higher than 18,000 ft MSL — while UAT is limited to aircraft that will operate no higher than 17,999 ft MSL. So far, no country except the U.S. has accepted the 978 MHz UAT format for their ADS-B datalinks. Consequently, pilots who want to fly outside the U.S. — or operate at or above FL180 — will need the 1090 ES transponder for ADS-B “Out”. Since the FAA has decided to retain its Mode C and Mode S transponder requirements for flight in regulated airspace (to provide a secondary radar backup to ADS-B, as well as communicate with other aircraft that have traffic warning systems), the 1090 ES solution can satisfy both the ADS-B “Out” and functioning transponder requirement with the same piece of equipment. What is a “squitter” anyway? If you’ve ever flown with a Mode S transponder, you’ve already done your fair share of “squittering.” By definition, the word “squitter” refers to a periodic burst or broadcast of aircraft-tracking data that is transmitted periodically by a Mode S transponder without interrogation from controller’s radar. Mode S ( which stands for mode “select”) technology was first developed in the mid-1970s as a way of using existing ground-based secondary surveillance radar (or SSR) to track onboard transponders more precisely and more efficiently — while reducing the number of interrogations required to identify and follow aircraft on the controller’s radar scope. To greatly oversimplify the terminology, a “squawk” is a response a transponder makes to an ATC interrogation, while a “squit” is a transmission format that routinely sends aircraft ID and positional information without being interrogated. By reducing the need for back-and-forth interrogation/response over the air, the Mode S squitter works to minimize transmitted “chatter” in the system — and, thus, increase its target-handling capacity. ES means more data per squit. Under the current Mode S setup, a standard transponder squit only sends the most basic aircraft identification, system status and pressure altitude information — which ATC’s ground computers must correlate with radar tracking information to derive aircraft position, direction of flight, airborne velocity, vertical climb/descent, and so on. Under the new ADS-B concept, each aircraft’s approved GPS navigation system will generate all of this data, and then transmit it at least once per second by means of an “extended squitter” — allowing ground controllers and other aircraft in the vicinity to track each airplane’s flight path with much greater precision and accuracy. In fact, some 49 individual parameters can be sent over the extended squitter, compared to three for Mode C and seven for basic non-extended Mode S.
Eventually, when the transition to ADS-B is complete, the higher capacity ES datalink will allow controllers to see not only what each aircraft is doing, but what it intends to do. The route you have entered into your navigation system will be broadcast on the ES so controllers and other pilots can see where you intend to fly. With this futuristic technology, the clairvoyant mind-reading that some pilots seem to expect from ATC controllers won’t seem so unrealistic after all. Any Additional Questions or Information to Add? Copyright © 2019 Cutter Aviation. All Rights Reserved.